New for 2019, our jigsaw puzzle grading scale will help you choose the right puzzle for you. All puzzle will be graded - eventually! 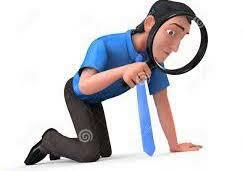 But if there is a particular puzzle you are not sure about, just ask us if it hasn't been graded yet. 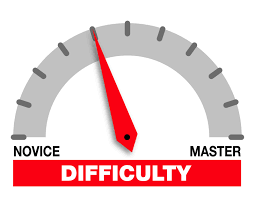 You can find CJ's Jigsaw Grading Scale on our Jigsaw Page. The best way to relive our childhoods has to be through the books we read. And also reading books written long before we were born give us a wonderful insight into the childhoods of our parents and grandparents and what shaped them, their views and dreams. 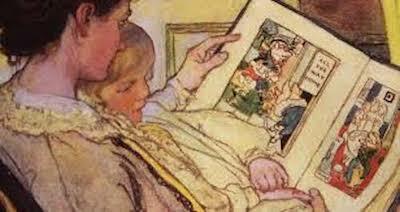 All of us at cj-books-etc love our vintage books and children's books in particular. The fun, innocent and simple, the wonder, and the feelgood factor are irresistible so browse our growing selections and maybe find your favourites. We have also included books in languages other than English and translations of well-loved books from other countries in our Worldwide section. 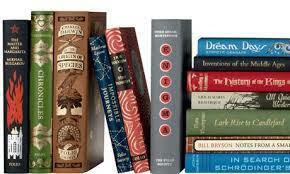 Don't forget we have a finding service (details at the bottom of the page) where we will hopefully find any book you are looking for which isn't on our pages. Vintage books also make great gifts for discerning readers! Books are not just functional items but can also be works of art in themselves. And for the best examples of these you are hard pressed to find finer than the Folio Society Editions. 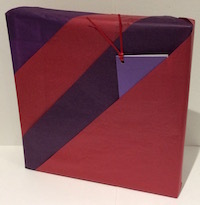 Click through to our dedicated Folio Society Editions page to browse the fine examples we have on offer here at cj-books-etc. Observer Pocket Books are a part of British literary history. Most people have owned (or borrowed) a copy covering a particular interest they had. Check out our great selection of Observer Books and maybe restart or even complete your collection. 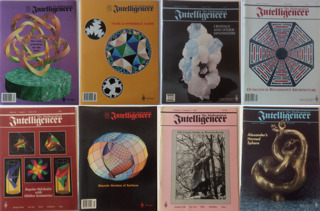 We are delighted to be able to offer a comprehensive selection of back issues of the classic popular mathematics magazine The Mathematical Intelligencer. Published by Springer Verlag, the Intelligencer covers a wide range of mathematical topics with each issue having something for everyone. It's "about mathematics, about mathematicians, and about the history and culture of mathematics." Click through to our feature page. We are really excited to bring to you a selection of jigsaws of paintings by Ted Blaylock. Blaylock is a renowned self-taught award winning American artist who has brought the nature and history of his country to life. Take a look at our new Ted Blaylock feature page which includes an interview video with the man himself. 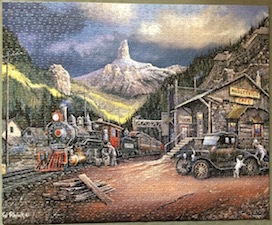 For all Thomas Kinkade fans, check out Blaylock's puzzles which we think give Kinkade a run for his money. They portray an earthier side to American history than Kinkade, but his attention to detail and majestic scenery bring his paintings to life. Well worth a look! STAR TREK - to boldly go where no-one has gone before! Check out our new Star Trek feature page where there are books for all Trekkies, old and new including vintage publications and great value collections. 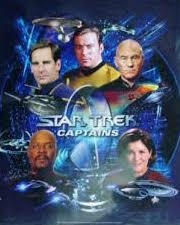 Whether you think Star Trek is just fun entertainment or much much more, there is something for you on cj-books-etc where Trek fans can find books from The Original Series through to Enterprise. These iconic square boxed jigsaws from Gibson's are always a joy to assemble. They depict works by famous artists and photographers and are constructed from the same high quality pieces that are a trade mark of Gibson's. Check out our great range of puzzles in this series on our Heritage Jigsaws page. We are pleased to stock items in one of our favourite special interest areas: trains and railways both past and present. 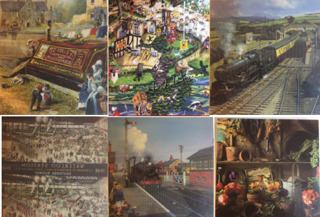 From the Flying Scotsman to the huge American locomotives; from the Orient Express to the branch lines of bygone times, there is something for every rail enthusiast on our dedicated Railway Books and Railway Jigsaws pages. We all remember the books we had as children and what more fun books were there than the Annual. Almost an obligatory Christmas present, they gave hours of fun without a battery or computer chip in sight! All of us here at cj-books-etc love old books and old children's books are the best. We are delighted to have on offer a great selection of vintage children's annuals and comics and not to leave us adults out, we also have a fabulous selection of rare adult annuals and comics. 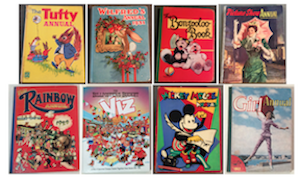 So check out our Vintage Annuals section where we have many selections of books on offer. 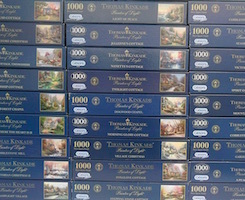 Our selection of Thomas Kinkade jigsaw puzzles is expanding. Check out our range on our dedicated Thomas Kinkade page. 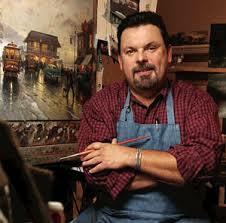 If you're a Thomas Kinkade fan then you are sure to find something you like. But if the particular puzzle you are looking for isn't there, fear not! We have many more waiting to be carefully checked and listed. Just contact us and we will let you know when they are ready to purchase. 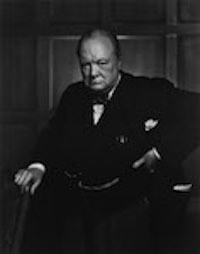 We are pleased to stock a number of classic items by this towering figure whose leadership skills were matched only by his wit, wisdom and scholarship. Check out our dedicated History page for details. We are pleased to stock a number of books by this outstanding writer, poet, journalist, activist and much more. 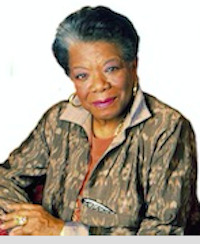 Check out our dedicated Maya Angelou page for more about this influential character. As well as books we have always loved jigsaws. Check out our current offerings on our jigsaw pages. We have jigsaws of Thomas Kinkade, Wasgijs, Photomosaics, Murder Mysteries and many more to follow.